Happy Thanksgiving and Black Friday. Instead of Cyber Mondaying, take some time to educate yourself about the state of the economy. First thing's first. I often get asked "what's this fiscal cliff everyone is talking about." If you already know, bear with me. When times are economically good (like the 90's, and early 2000s) we (the government) has lots of tax revenues, so it can technically cut taxes (makes people happy) and spend all kinds of money on programs and defense and all that good stuff (makes government happy). When times are not so good (like the last couple years) we (government) don't have enough money to keep paying for all those things we used to, but its the government, and it is really hard (read SLOW) to change our spending habits. So we over-extend, rack up debt, and get in financial trouble. Recessions happen, people lose their jobs, markets crash. People's pensions get cut in half. Payroll tax cuts go away, Alternative minimum tax changes, other tax breaks go away. Budget Control Act of 2011 (remember the Debt Ceiling?) automatic spending cuts kick in. These, amongst others, are the forces pushing the economy and nation up to a "fiscal" cliff. The general concept is taxes go up and government spending gets automatically cut. The question is what happens when, and if, we go over the aforementioned "cliff." 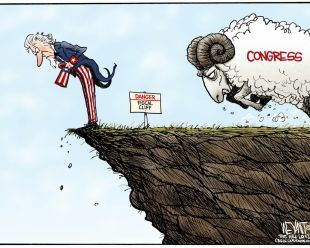 If we go over the cliff, the markets should crash, unemployment should rise again, and we should have another recession. Or would we? The last few years have been lean, no question (unless you are one of these kids). These economic reforms sure seem like an anti-stimulus package. But is this what the country needs? We might just cut our deficit, clean up entitlement programs, cut the pork, and prevent having to do this all over again a few years down the road. Tough call. I don't think anyone can honestly say they want to pay more taxes, but a good many don't want to see our debt hamstring the next generation either. Hopefully they meet in the middle. Ok, what does this mean for you and I. If you work in a government funded agency, (for example, scientific research funded by government dollars) you better hope these entitlement cuts don't come down: your job might be at risk. If you are one of the millions of retired Americans who did everything right, saved and maxed out your pension, you better hope the forces in Congress do not push us over the cliff. If your portfolio is still in tact after 2008, it likely cannot handle another huge hit. No one knows what is going to happen. However, many people are taking advantage of the current estate and gift tax exemption levels, as well as cashing in on the current, likely lower capital gains rates. I don't think the estate tax will revert back to $1 million: that just hurts too many people. I do, however, feel the Obamacare taxes on dividends and capital gains will come into effect. Any financial planning based on the fiscal cliff fears is really a gamble, much like investing in the stock market (unless you have insider information, of course). We have about a month to go. Time to place your bets.